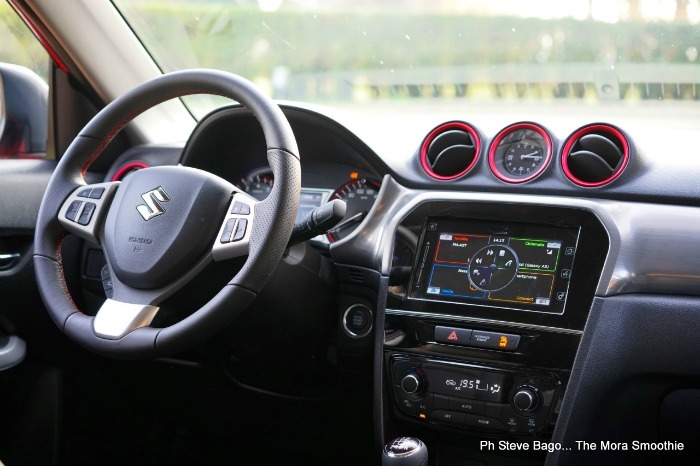 The Mora Smoothie fashion blog, DIY fashion by Paola Buonacara: Suzuki Vitara S ! Fashion car testing! Today I wanna tell u about my experience with the new Suzuki Vitara S, I've got the opportunity to drive it during the last Milan Fashion Week. Oggi vi voglio raccontare della mia esperienza con la nuova Suzuki Vitara S, che ho avuto a disposizione durante la scorsa Milano Fashion Week. This model is the sport version about the new Vitara I had already drove here and here. Perfect to drive along the traffic jam of Milan, it has always presented bright and elegant during the night events and I have to admit that struck me right away for the perfect harmony demonstrated with every outfit I wore during MFW! A car that does not go unnoticed, many were curious glances driving it through the down town streets and then, in this version, the sporty driving can excite you immediately! Among other things this model has an endowment rich that will make your journey safe and comfortable. I would say a great choice for those who want a sports car with the comfort and space of a SUV and has passed with high votes my fashion test, a bright light and jaunty between the boring black limo you can see during Fashion Week! Below, pics and a short video from my YouTube channel! P.S: if u are interested in a technical study and in a complete car testing don't miss the post by Autoappassionati. Questo modello è la versione sportiva della Vitara che avevo già provato qui e qui. Perfetta per gli spostamenti nel traffico di Milano, si è sempre presentata luminosa ed elegante durante gli eventi serali e devo ammettere che mi ha colpito subito per la perfetta sintonia dimostrata con ogni outfit che ho indossato durante la MFW! Una vettura che non passa inosservata, numerosi erano gli sguardi curiosi guidandola per le vie cittadine e poi in questa versione la guida sportiva ti entusiasma da subito! Tra l'altro questo modello ha una dotazione molto ricca che renderà il vostro viaggio sicuro e confortevole. Direi un ottimo connubio tra chi desidera un'auto sportiva e la comodita e lo spazio di un SUV e che ha superato a pieni voti la prova fashion, una luce brillante e sbarazzina tra le noiose berlinone nere che si aggirano durante la Fashion Week! Di seguito foto e un breve video dal mio canale YouTube! P.S: se siete interessati ad un approfondimento tecnico non perdetevi la prova completa di Autoappassionati. Cool this car, like also the red! Ma tu lo sai che l'altro giorno stavo guardando le tue foto su FB e ho pensato che questa macchina è proprio bella, ma tanto. Poi incredibilmente mi piace rossa! E' davvero bella quest'auto, perfetta x te!!! It is extremely common that the youthful understudies get pulled in to fashion the most and begin following our website the patterns in a split second so fashion impacts our childhood unequivocally. To everything except the most recognizing adornments,Michelle Pfeiffer Wrinkle Cream they will resemble the genuine article, without the worry of thinking about such a costly piece.